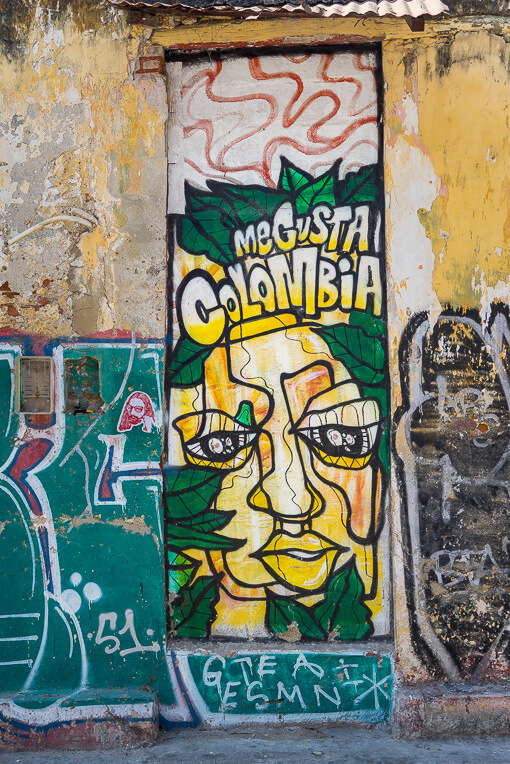 Most people are not aware that Cartagena, Colombia, is a treasure trove of street art, and it is located just steps away from the Old Town. 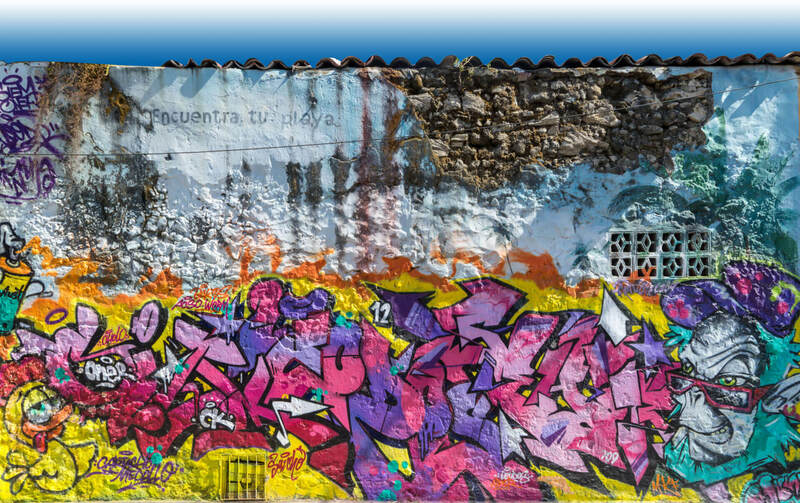 The neighborhood of Getsemani was formerly a low income part of Cartagena, known for drugs and crime. 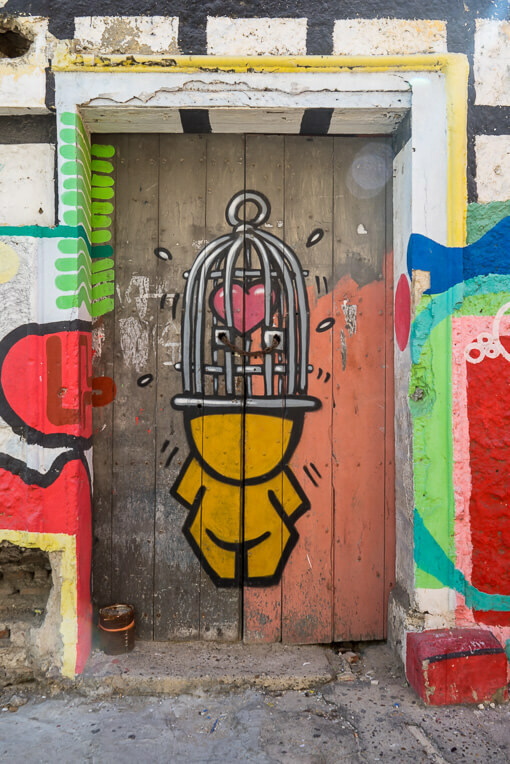 These days, Getsemani has shaken off its gritty reputation and is no longer a place to avoid. The area has been transformed into a colorful menagerie of hostles, lively cafes, and bustling nightlife. The gentrification of Getsemeni has also brought about an artistic revolution in the community. 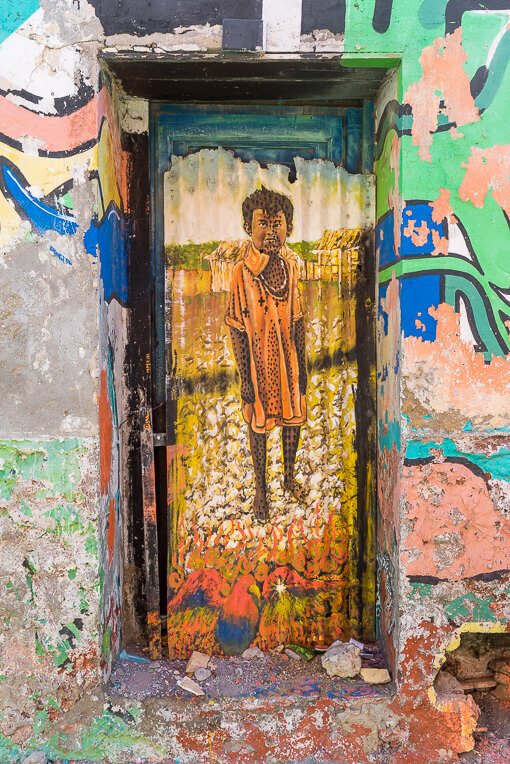 Wandering through the pastel maze of colonial houses reveals eye-popping, vibrant street art – much of which are inspired by local legends and culture. 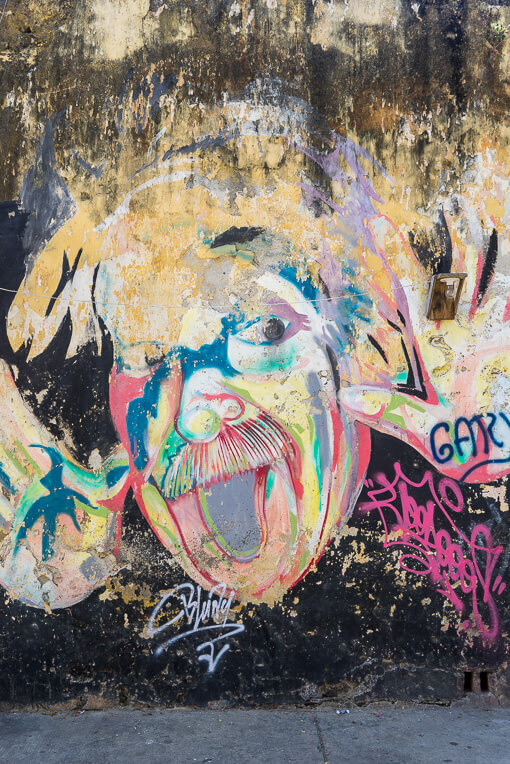 The next time you visit Cartagena, you’ll want to stroll through Getsemani and check out the street art for yourself. 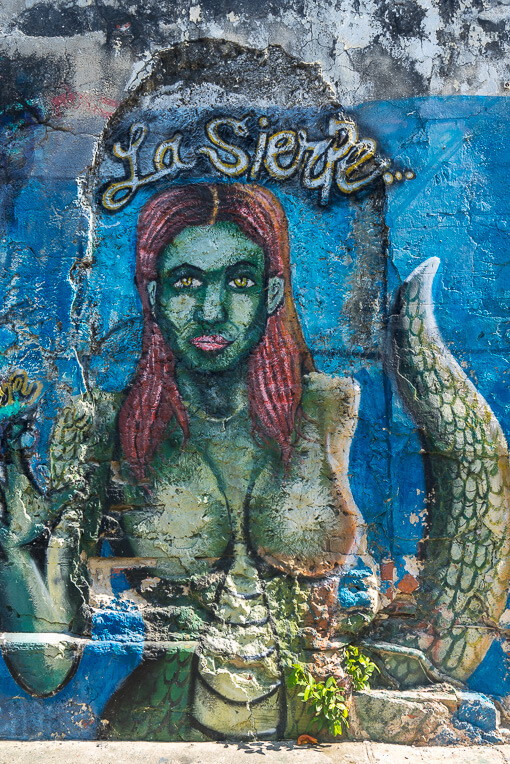 This mural of a half-woman, half-snake located on Calle 29 in Getsemani – better known locally as Calle De La Sierpe (The Street of the Serpent). The street received its nickname from a local legend. In the early 1600’s, the inhabitants of Getsemeni would sometimes hear the hissing of a snake at night, but were too afraid to venture into the street to investigate. The mayor at that time, Don Antonio de Viloria, decided to stand guard over the street one night to find out the cause of the hissing. Suddenly a huge snake appeared with menacing, glowing eyes, and rattling its tail. In an act of desperation, Don Antonio summoned some magical incantations that he had learned on the island of Santo Domingo. The spell reveled the snakes true nature: a sorcereress. Despite her plees for release, the witch was immediately imprisoned. She was later sentenced to 200 lashes and banished. While almost every street in Getsemani features murals and paintings, Calle De La Sierpe is a great starting point. A good portion of the street is covered in stunning street art. 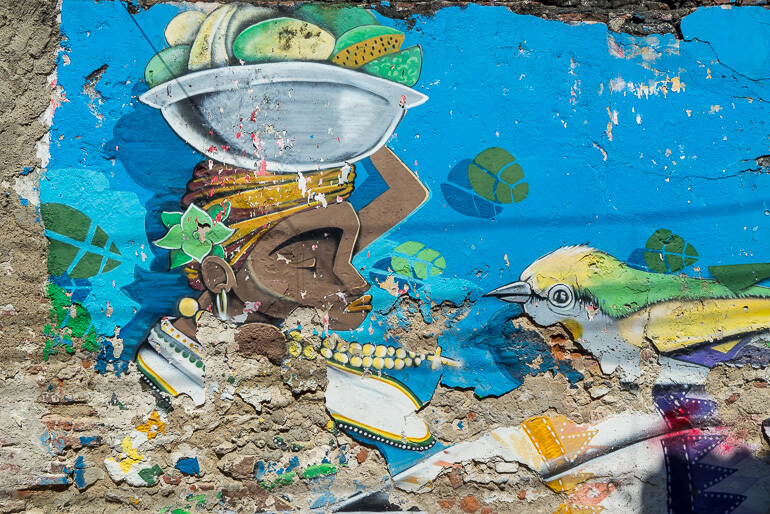 This striking mural of a grinning Afro-Colombian woman dominates one side of Calle De La Sierpe. 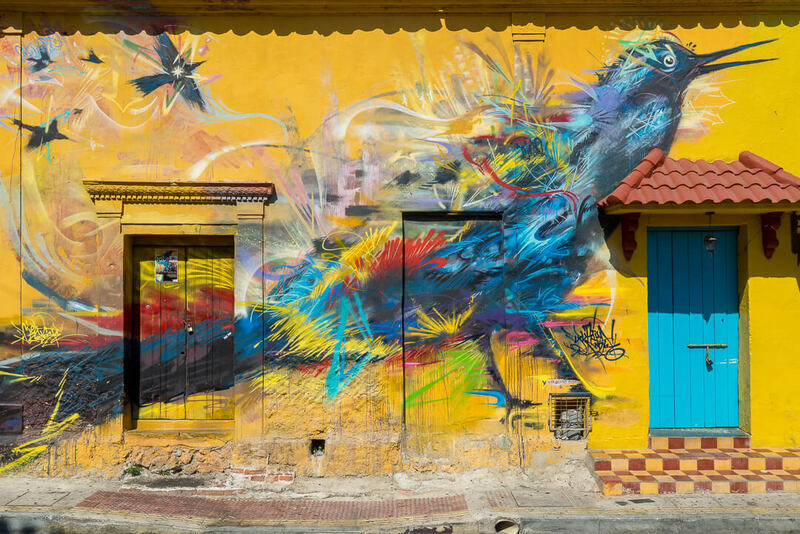 It is one of the most photographed pieces of street art in Cartagena. The great-tailed grackle, more commonly known in Colombia as Maria Mulata, is the official bird of Cartagena. Colombian artist Yurika was inspired to paint this vibrant street mural by a local folk tale. According to fokelore, the Maria Mulata was once a colorful songbird that lived in peace and harmony with the people of Cartagena. At that point, Cartagena was a small town. One day, the town caught fire and many of the inhabitants were trapped. As they cried out for rescue, the birds swooped in and carried the townspeople to safety. In the process, the birds’ vibrant plummage was stained black from the smoke and soot. While they retain the black color to this day, a close examination on a sunny day reveals the hint of color underneath. The mural of the Maria Mulata can be found in Plaza De La Trinidad. During the day, the plaza is a sleepy, colorful square in the heart of Getsemani. But at night, the plaza comes alive with street vendors, cafes, and crowds of backpackers. 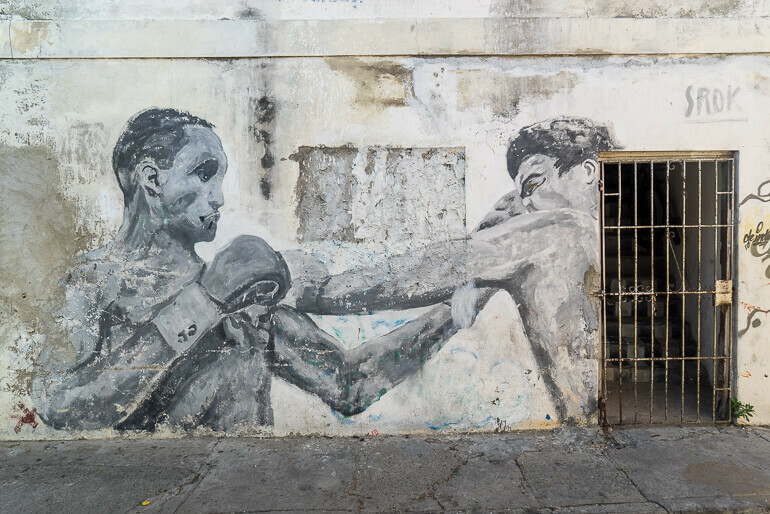 This mural recreates the famous rivalry between two-time world middleweight champion boxer and Cartagena native, Rodrigo Valdez, and Carlos Monzón. Flying the flag of Cartagena, a working-class man protests the sale and higher prices of housing in Getsemani as a result of gentrification. 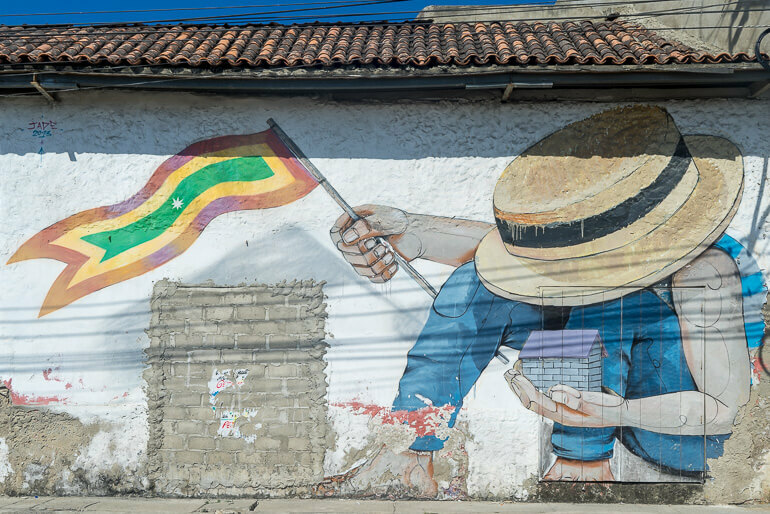 At 12-stories tall and covering over 400 square meters, this mural in Getsemani is the largest in Cartagena. The piece is the result of a collaboration among seven well-known street artists: Yurika, Cazdos, Zas, Ecksone, Skida, and Ospen. 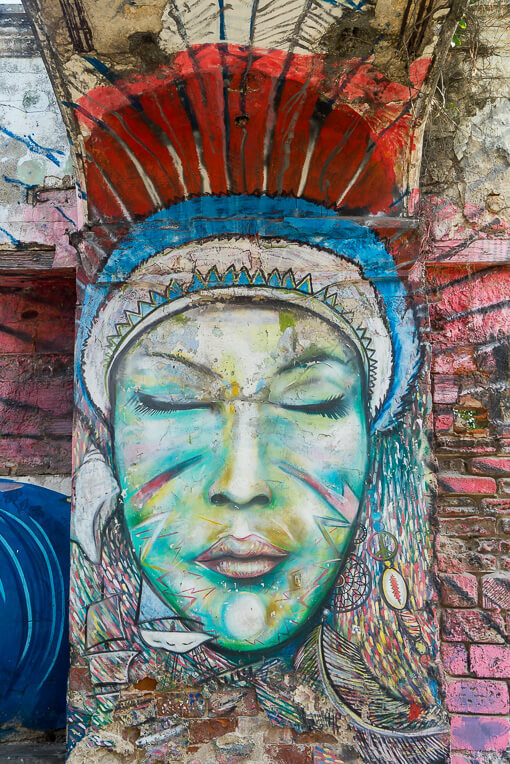 It came to life in 2012 as a result of the team’s reflections on the challenge, of representing, through graffiti, the Afro woman. In effect, the work captured an Afro woman at the moment of creation-reflexive and serene-not only as a mother but as the axis of the black culture. A prism gravitates in the hands of this character, alluding to the power of transformation of its environment, with a special thread: the explosion of color. 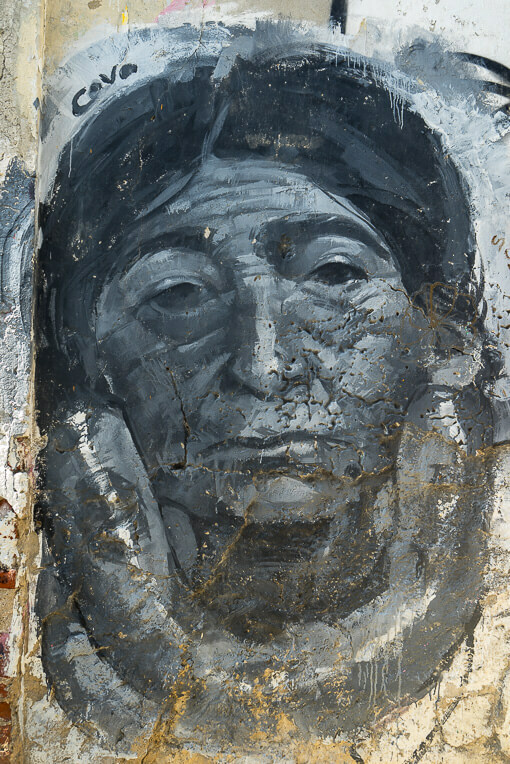 Due to the challenges of painting such a massive mural very close to the surface of the building, the mural was designed ahead of time and projected onto the face of the wall. The artists used a pully catwalk to paint the mural over the course of 6 days. 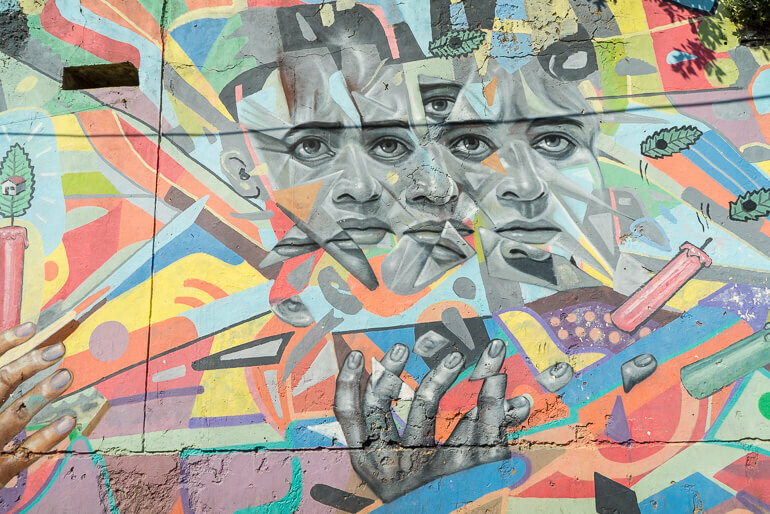 The result is a vibrant and overwhelming piece of art that dominates the Getsemani skyline. 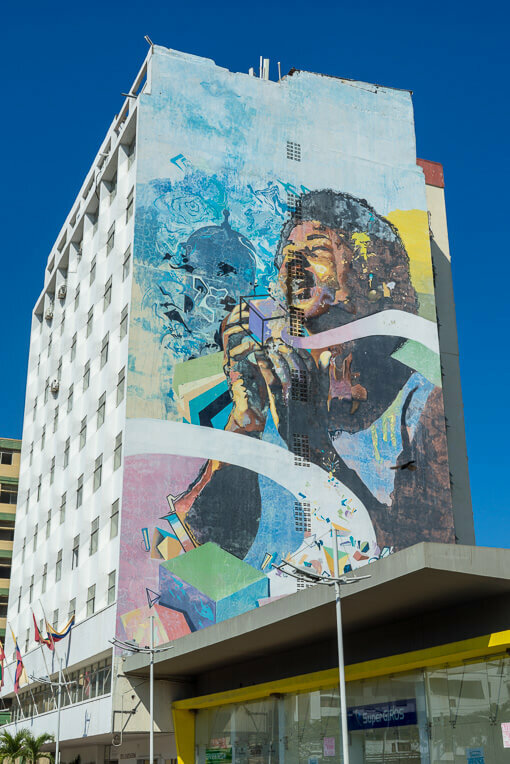 According to local rumors, the Afro Prismo mural was originally commissioned by the Coca-Cola company to advertize Sprite. The legend goes on to claim that the artist reneged on the agreement after receiving payment for work and never completed the work, painting a cube in the subject’s hand instead of the product placement: a can of Sprite. This beautiful triptyc – portraits of the same woman – is by artist Fin DAC. The artist put out a call for model submissions and chose a local woman from Cartagena, Ana Luisa M, as his muse. 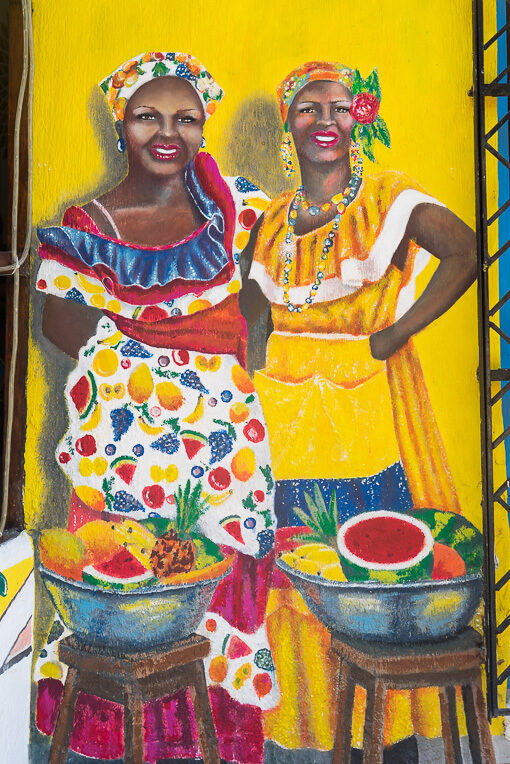 Palanqueras – women dressed in bright colors selling fruit – are a common sight in Cartagena. Originally these women came bearing their goods from San Bassilo de Palenque – a small town to the south of Cartagena and one of the first free towns in the New World. Several urals throughout Getsemani celebrate modern Palenqueras, who still offer fruit for sale on the streets of Cartagena. The coastal Colombian area where Cartagena now stands was once inhabited by the Calamari people. 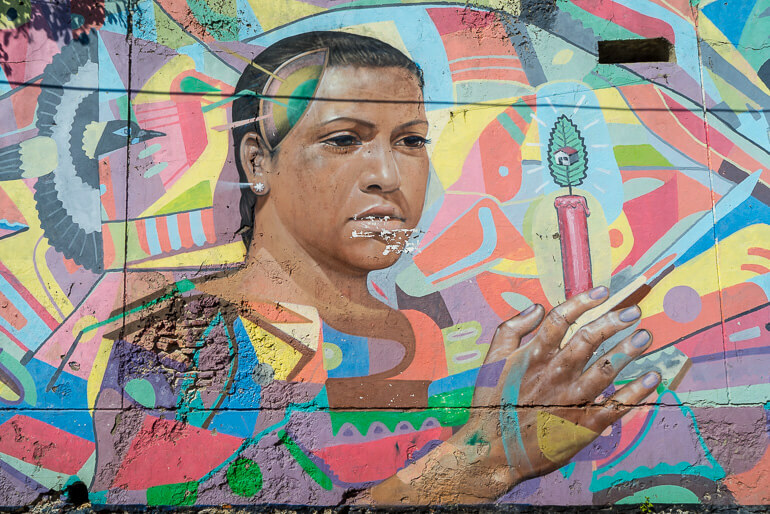 A number of murals throughout Cartagena pay tribute to the original indigenous inhabitants. Below: This mural of an indigenous woman had, at one point, a large headress of feathers that extended beyond the column of the bridge. Over the years the headress has faded and parts of it have been painted over. 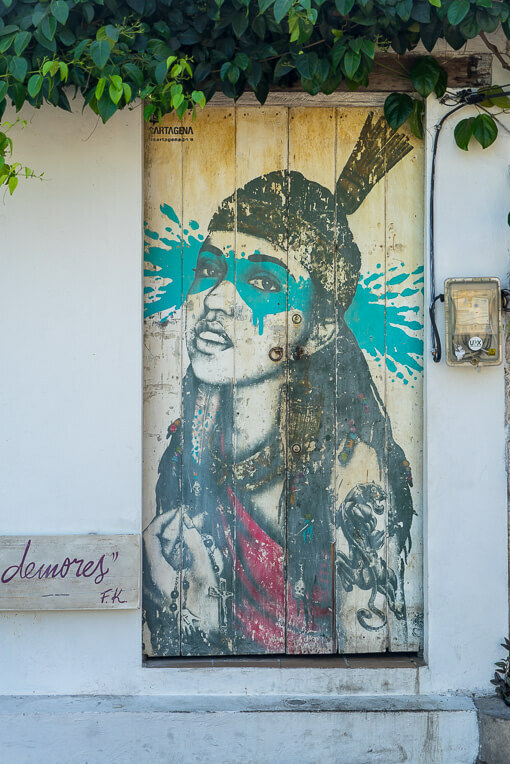 Above: One of the signature pieces of street art in Getsemani, “La Heroica” depicts an vibrant and beautiful woman indigenous to the area around Cartagena. Painted in 2013 by Irish artist Fin DAC. 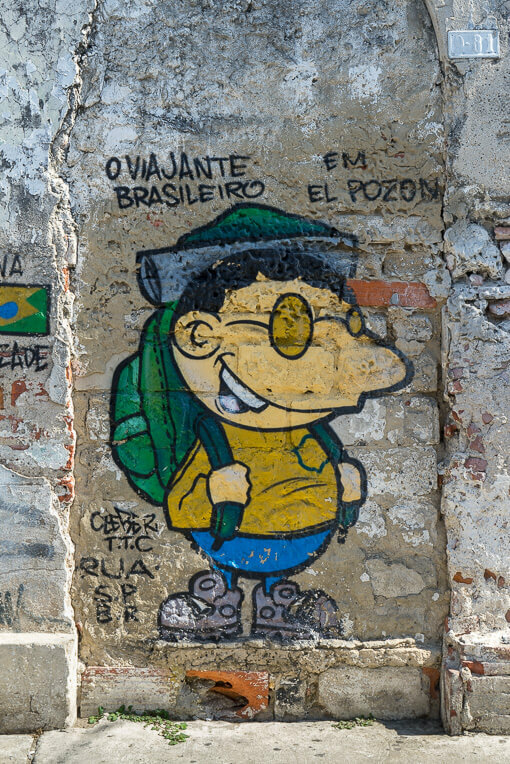 The neighborhood of Getsemani is easily walkable, so feel free to wander around the discover the amazing pieces of street art on your own. 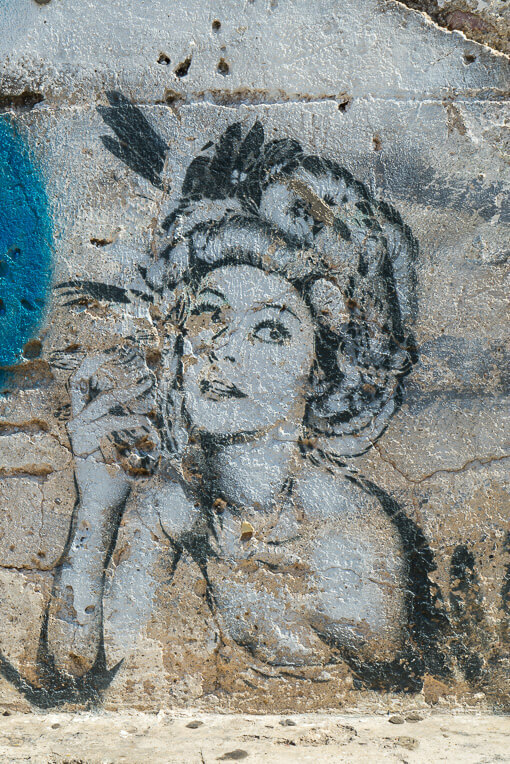 There is also a free street art walking tour offered daily (except Tuesdays) at 10AM. The tour starts at Plaza De La Trinidad and lasts for 2 hours. You can sign up online, and be sure to tip your guide when you are done.